The Dainese Santa Monica Perforated Leather Jacket carries a name that conjures the beauty of the West Coast. This varied terrain ranges from cool coastal temperatures to the toasty desert inland. This jacket should perform well in this spectrum of temperatures. First off, this jacket is perforated for breathability and airflow with its liner removed. Perforated leather is the best protection you can get and still stay cool. Also included is a removable thermal microdown lining for the cooler temperatures. The Santa Monica incorporates an aerodynamic hump in the upper back. For protection, the Santa Monica features good low profile armor in the shoulders and arms. However, one of my pet peeves is premium apparel that does not include CE-approved armor in the back, and that includes this jacket. One really nice feature this jacket has is anti-grip titanium protectors on the shoulders that are inspired by the ones worn by MotoGP champion Valentino Rossi. He is, after all, sponsored by Dainese. 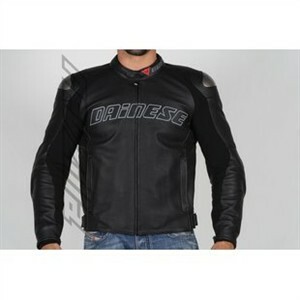 The Dainese Santa Monica Perforated Leather Jacket is another nice, premium jacket offered up by the Italian company. Riders report that the sizing is accurate, but you'll have to convert the Euro size to US sizing. It is offered in Euro sizes 44 - 60.